One century ago Republican Theodore Roosevelt was elected president and instituted sweeping changes in government, including the establishment of an estate tax and the national park system. What followed was an economic boom that lasted for years. Roosevelt knew the importance of circulating wealth in order to revitalize the economy by investing in key infrastructure, including the public education system. 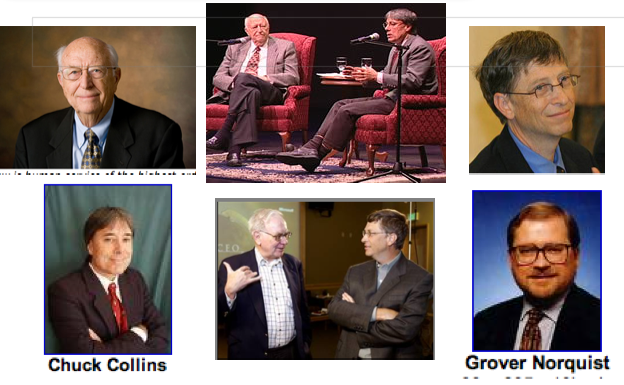 While Bill Gates Sr. has co-penned a book with Chuck Collins calling for increased exemptions but not abolishment of the estate tax, Bill Gates Jr. has been the prime funder of Grover Norquist as Norquist tours the country relentlessly advocating a complete repeal of the tax. Like Bill Gates Sr., I believe the exemption should be raised to $5 million yet do not support a repeal. I met Grover Norquist, the nation’s most ardent anti-tax advocate, here in Portland some years ago and was amazed at his persuasive skills, and also his ability to bend facts. When I asked Norquist what he would think if I told him Microsoft made more than $10 billion in one year without paying a penny of federal income tax he replied, good for them. Norquist seems oblivious to the growing acknowledgment that tax equity or fairness is essential to healthy capitalism. Even the Howard Jarvis tax institute, founded by his mentor, publicly stated that there were serious fairness issues related to Microsoft’s scheme. But Warren Buffet, like the younger Gates, has also been able to sell vast holdings within the structure of his foundation, thereby avoiding all taxes. The Bill and Melinda Gates Foundation has sold all of its Microsoft shares, not even keeping 10% out of loyalty to the company’s employees. Of course not a penny of tax was paid on any of these sales and today the Gates Foundation aggressively invests in activities ranging from private equity to currency speculations with all gains completely shielded from any tax consequence. One simple reform to the system would be to allow tax exempt income status to foundations and endowments only for that portion of their investments invested in US government securities. All other investments would be taxed at normal capital gain rates. Perhaps this would help to stabilize the markets and eliminate the excessive risk-taking and speculation many of these tax exempt entities are engaged in, knowing they would have no tax liability on gains. As the policy debates rage on regarding changes to the tax law, let’s hope that overall fairness has a strong seat at the table, whatever the outcome.